Ray fishing in Dorset has gone mad. From the fossil Forest, through Preston Beach and all the way west along Chesil to Seaton, Rays have been caught in decent numbers. I had a confirmed report of a 17lb Blonde ray coming from West Bexington , Undulate and Small Eyed Rays from the Ferrybridge area of Chesil ad Undulates from Preston. Mix that with some Thornback Rays and you can guess what I wil be fishing for this weekend. My theory and I might be well wide of the mark, is they are following the Spider Crabs inshore. The spikey shells of the crabs are no match for the crushing power of a large Ray. Best baits are going to be Crab and Sandeel. It won’t just be Rays that will be around this weekend. Expect plenty of Smoothound and Mackerel. 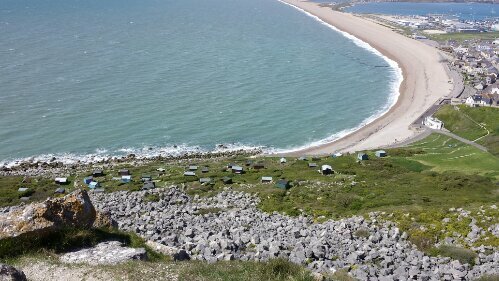 Chesil Beach forecast: Chesil Beach is my top tip for this weekend. Mackerel, bass and Rays should all be around, with Plaice a good possibility from Abbotsbury and Cogden. If you are looking for Pollock and Wrasse from the beach then head down Chesil Cove end of the beach. You should be able to find Smoothound all along the beach. Portland: Portland should be another good mark this weekend with plenty of Wrasse and Pollock about. If we are lucky then we could see some Bass falling to lures. Where are all these fish? Three of us fished West Bex today from 6am-after afternoon high. along with us an about 30 others NOT one mackerel was caught! My mate Tony had a small starry, but this also was the only fish we seen or heard caught. The may bloom covered the sea as far as we could see! Spiders were the only things feeding! The water is much clearer towards Portland, as it is deeper than West Bexington. For some reason the western end of Chesil is being effected much worse than normal with May water. Unfortunately it is the normal case of those that can cast much further seem to be able to get into the fish in poorer conditions. I wish I was one of those, but I have to make do with 100yds with bait. It depends on what fish you meen Rob. Bass, Dabs and Mackerel are often very close inshore. As close as 20yds or even less sometimes. Smoothounds, Rays and Plaice tend to be much further out. You normally need a good 100yd cast with bait. I do meen a proper 100yds. The amount of anglers that I see cast what they think is 150yds with bait is incredible. Most of them cant hit 60yds. I am not trying to be derogatory to them as I am no great caster, but I can actually hit 100yds with bait. Unfishable due to may bloom, avoid abbotsbury until it clears. Blanked yesterday. Fished Abbotsbury last week and we had the May bloom, did not see any fish caught along the beach all day, even had a kayaker one mile off shore saying the water still coloured out there.